The ever-expanding list of U.S. states whose lawmakers are currently proposing, considering, and/or passing online poker legislation now includes New York, as yesterday’s state budget discussions saw two New York state senators propose the state legalize online poker as a possible revenue source. It isn’t clear what “state court ruling” is being alluded to by the senators’ staffers, as there has been no such ruling. It is possible the reference is to federal judge Jack Weinstein’s ruling from last August in a Brooklyn district court that poker was a game “predominated by skill rather than chance.” That ruling came in the context of tossing out the conviction of an underground poker club operator for having violated the Illegal Gambling Businesses Act (United States v. Dicristina). In any case, another state senate source has further suggested that passing an online poker bill could result in the immediate collection of $100 million in licensing fees, as reported by the NY Post. Much work remains, however, with many unresolved conflicts between the state assembly and senate and New York Governor Andrew Cuomo over the budget still evident. A new state budget is due to be approved by April 1, although lawmakers are expected to do so by March 21 so as to avoid conflicts with Passover and Easter at month’s end. The news of online poker potentially emerging as a topic under consideration by New York lawmakers comes amid a couple of intriguing contexts. One, of course, is the emergence of several states’ lawmakers showing interest in following the lead of Nevada, Delaware, and most recently New Jersey as the first states to pass online gambling legislation. Numerous states are at various stages of such discussions, including California where yet another online poker bill has been recently introduced and Illinois where online poker came up in a recently-passed omnibus gambling expansion bill. Another, New York-specific context is the current debate within the state over whether or not to open as many as seven new casinos within the state. After having debating that possibility for more than a decade, both houses adopted a constitutional amendment last year allowing for such, and if the present legislature does so again in time (as required), New York citizens will be voting on the amendment this November. The passage of such an amendment would allow for the first non-Native American owned casinos to open in the state. Just this week, Gov. 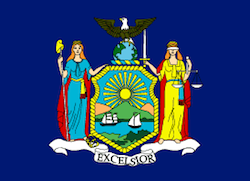 Cuomo stated his intention to have the first three casinos built upstate so as to give them a chance to succeed before any New York City casinos were opened. While the introduction of new casinos in New York seems a genuine possibility, the chance of any online poker legislation being passed any time soon appears much less likely. Even so, as is the case elsewhere in the U.S. at present, poker and gambling are certainly on the minds of at least some legislators in the Empire State.